No Peace Without Justice, the Inter-African Committee on Traditional Practices Affecting the Health of Women and Children and Euronet-FGM organize a high-level meeting on the International Campaign to Ban Female Genital Mutilation worldwide at the 65th session of the United Nations General Assembly, to be held on 23 September 2010, 6:00 – 8:00 pm, in New York. The First Lady of Burkina Faso H.E. Mrs Chantal Compaoré, a long-time campaigner against Female Genital Mutilation and the Inter-African Committee Good-Will ambassador, will open the evening’s proceedings. Prominent human rights defenders, members of Parliaments and civil society activists from countries where Female Genital Mutilation is committed will take the floor to present the International Campaign to Ban FGM worldwide, in which they are actively involved through their advocacy with Member Countries, International Organizations and Institutions, to support a UN resolution against FGM. Participants will also include, among others, Franco Frattini, Minister of Foreign Affairs of Italy, Emma Bonino, Vice-President of the Italian Senate and former European Commissioner, Rachel Mayanja, UN Secretary-General’s Special Adviser on Gender Issues and Advancement of Women, Louise Arbour, President of ICG and former High Commissioner for Human Rights, Carol Bellamy, former Executive Director of Unicef. The event will be an occasion to support the fight against female genital mutilation and the international campaign to promote the adoption of a Resolution by the 65th United Nations General Assembly that universally and explicitly bans FGM. The United Nations Resolution would be an extremely important instrument to underscore the gravity of Female Genital Mutilation as a human rights violation, specifically the right to physical integrity, that affects the lives of millions of women around the world. 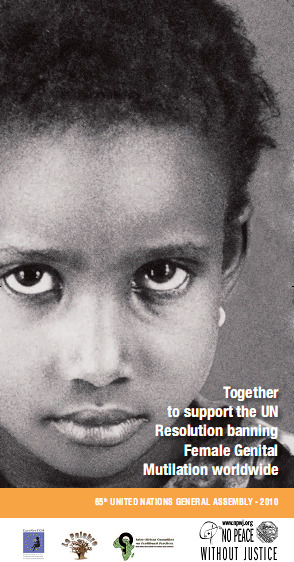 The UN Resolution, in addition to being a worldwide ban on female genital mutilation, would reinforce the regional and international conventions that recognize FGM as a violation of human rights, give new impetus to efforts to improve national laws banning FGM where they exist, or to adopt one, where they do not, as well as provide strong and clear support for all activists working to bring an end to the practice.